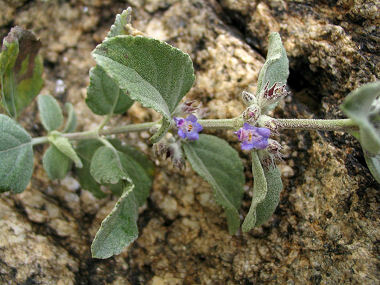 Desert Lavender is a member of the Mint Family. The plant appears as a shrub and grows to 15 feet in height with grey green, oval, hairy leaves with serrated edges that grow to 2.5 inch in length. The plant typically grows in desert washes and dry, rocky slopes at elevations below 5000 feet. The minty leaves of Desert Lavender are used to flavor tea, though to me they smell like a Vicks vapor inhaler. Desert Lavender blooms year round and produces small purple flowers with 5 petals that grow from the joints where the leaves join the step of the plant.